The Concert Agency Wolfgang Trojan offers you comprehensive, reliable advice about your choice of artist and will take care of the issues concerning finances, dates and organization with respect to the performance. Moreover, together in discussion with you and the artists, we can create a diversified concert according to your special wishes and will also take care of the moderation, if necessary. 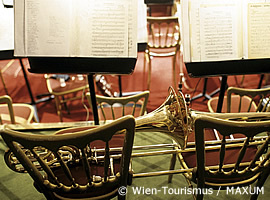 The Concert Agency Wolfgang Trojan has made it a priority to cultivate a tradition which Johann Strauss began: to offer first-class Viennese popular music and classical chamber music of the highest niveau in the concert halls. Thus, our artists are an attractive addition to the standard concert fare. You are welcome to book our artists for concerts abroad. Take time, enjoy a concert within a splendid framework and treat yourself to a special listening experience. Under Concert Viennese Music you will find selected ensembles for a special concert experience with the tones from Johann Strauss, jr. to Johann Schrammel and Robert Stolz. At Concert International Music we offer you the best international entertainment from hits of the 20's to songs of Marilyn Monroe and the incomparable sound of Frank Sinatra. Under Concert Classical Music you will find special Austrian chamber music ensembles. Based on our many years of experience, we have decided to offer a one of our particularly oft requested and very successful ensembles under Our Special - the Viennese Ladies Orchestra Johann Strauss. Under Your Concert à la Carte you will find the complete artistic offerings from the section "concert": there you can put together your own personal concert entirely according to your own wishes - moreover, we can, of course, accommodate your special requests. We will gladly prepare an individual proposal for you, free and without obligation - and to save you time, we have prepared a thorough questionnaire for you. Contact us, we are looking forward to welcoming you and your guests. Under Downloads, as a special service to you, we have compiled the texts, photos and listening examples pertaining to all the artists under the heading "concert". We invite you to download your choice of data, free of charge and at your own convenience.